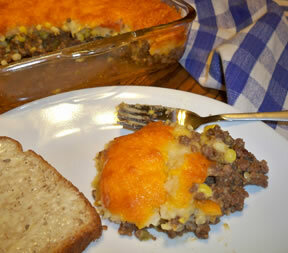 Traditional Shepherd's Pie is usually made with ground meat and white potatoes. I like this one because it has sweet potatoes mixed in and omits the meat filling. 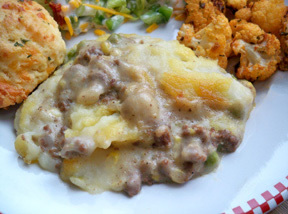 The curried lentil filling is sandwiched between two layers of creamy potato filling sitting on a crouton crust baked on top of sweet zucchini. It's sort of labor intensive - but don't be intimidated. It helps if you do all the chopping of the ingredients above first, and then follow the instructions below step by step. Time consuming - but NOT difficult; I promise the results are fabulous - and the dish is enjoyed even by meat-lovers! I serve this as an entree with a simple salad. 2. Bring 2 pots of water to a boil - a large pot for the potatos (see step 3, below), and a smaller pot of 3 cups of water for the lentils (see step 4, below). 3. POTATOES: Drop the cubed sweet and white potatoes into the large pot of boiling water water and simmer for 45 minutes. They should be easily pierced with a fork. Strain the potatoes, reserving 2 cups of the water. Pour 1 cup of the water back into the pot and mash the potatoes using a potato masher or a large fork. Add the olive oil, Italian seasoning, and Cajun seasoning and mash again until seasonings are completely blended into the potatoes. 4. LENTILS: Add bay leaf, lentils, and Cajun seasoning to the 3-cup pot of boiling water and cook for 45 minutes. Remove from heat when completely cooked and let cool briefly. Drain off any liquid. 5. Sauté the onions, garlic, mushrooms, broccoli, and bell peppers in the olive oil in a large sauce pan until the onions are transparent and limp, about 4 minutes. Add the reserved cup of potato water, nutritional yeast, salt, and curry powder and stir until everything is blended in. Add to the cooked lentils. 6. Dissolve the cornstarch in the remaining 1/4 cup water and stir it into the lentil and vegetable mixture. Continue to cook for 3 more minutes, until the sauce thickens. Remove from heat. 7. Line the bottom of a casserole dish with the zucchini rounds. Sprinkle half of the bread crumbs or croutons on top of the zucchini. 8. Spoon out 4 cups of the mashed potatoes and spread across the zucchini rounds. 9. Spoon out 2 cups of the curried lentils and spread on top of the potatoes. 10. Spoon the remainder of the mashed potatoes and smooth them out on top. 11. Sprinkle the rest of the bread crumbs and the scallions or green onion on top. 12. Bake for 50 minutes. Let cool for 15 minutes before cutting and serving.